The following is a typical schedule for our preschool room. Center opens. Breakfast begins and continues until 8am. Morning sign-in begins, in which each child begins learning how to write their name in the sign-in book. Choice Time. 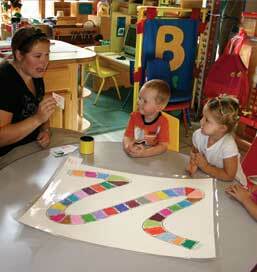 Children engage in supervised play with toys, books or in learning centers. Morning Circle. We begin our day with a good morning song and the Pledge of Allegiance. We read a story together using props to dramatize and relay the story. This is a hands-on experience where the children get to help tell the story. Learning Centers in small groups. Children have an opportunity to make props, practice skills and play learning games. 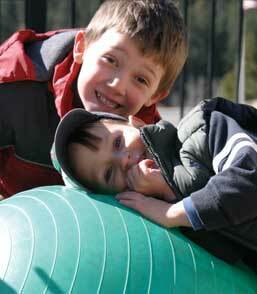 Gross motor development and outdoor play. Stories, books on tape, story CDs. Book Center. Look, listen and read books. Afternoon Circle. We focus on writing, letter sounds and recognition, and learning nonfiction material associated with the morning's story. During graphics practice children write and draw shapes and letters on white boards. We use play plans for more advanced writers who are ready to write messsages on paper. 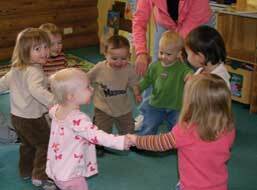 We incorporate music and movement in both the morning and afternoon circle times. Bearly Tawl Child Care Center closes. Share Bucket. Each week, one child is given the "share bucket" to fill with things from home that the child would like to share with classmates throughout the week. The sharing child has an opportunity to talk about each item during circle time. The share bucket is a great way to learn about sharing and also promotes confidence and self-esteem in a healthy way as children talk about their items and receive positive feedback from classmates. Classroom Jobs. Each student has jobs that rotate weekly, such as lunch helper, snack helper, line leader, etc. The expectations of each job are taught to the children who perform them. This promotes independence and self-esteem. Chilldren love doing their jobs!